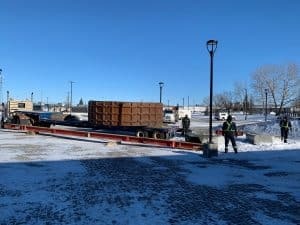 The Blairmore Ring (WDM-2017-S-49) was donated to the Western Development Museum by the Saskatoon Airport Authority. Originally erected in 1965 in Saskatoon’s Rotary Park, the Blairmore Ring is an homage to Saskatchewan’s potash mining history. The ring is five meters in diameter and weighs more than 28 tonnes. 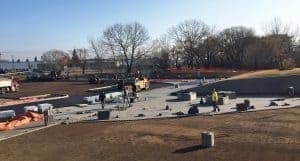 After spending 36 years in Rotary Park, the Ring was moved to the Saskatoon John G. Diefenbaker International Airport. In 2017, the Saskatoon Airport Authority donated the Ring to the Western Development Museum. Located at the front entrance to the Museum, the Blairmore Ring continues to stand as a testament to potash mining history of Saskatchewan. What is the Blairmore Ring? Simply put, Blairmore Rings are used to seal off water in a potash mine shaft. Development of the potash mining industry in Saskatchewan began in the early 1950’s. As workers began to sink the first shaft, they ran into problems getting through the Blairmore, which is a large water-bearing layer. Unfortunately, the shaft was lost and so was all hopes of getting through it. Fast-forward to the 1960’s and the development of the Blairmore Ring. The idea was to layer cast iron rings after (temporarily) freezing the water around the Blairmore layer. The idea was this would create an open shaft to drill through to get to the potash deposits. How do you move a 28 tonne piece of steel? The WDM is fortunate to have a longstanding relationship with Neufeld Building Movers (formerly Wiebe Movers Ltd.). 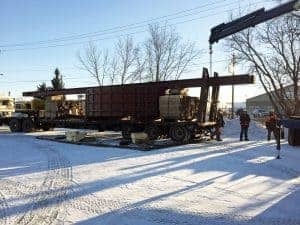 Over the years, Neufeld Building Movers has assisted the WDM in moving the Saskatchewan Wheat Pool elevator from Keatley SK to the WDM North Battleford, moving what is now St. Peter’s Anglican Church onto Boomtown Street at the WDM Saskatoon and removing some large equipment at the Corporate Office. This move required a lot of coordination! The transport of the Blairmore Ring from the Saskatoon John. G. Diefenbaker International Airport needed to be done after rush hour when there was less traffic, due to its large size. Once it reached the Museum, it was unloaded by rolling on steel beams to the blocks it would sit while the site was readied for it. The offloading process took a few hours. Fast forward to 2018 when the WDM Saskatoon parking lot was under construction. Cement pedestals were poured near the front entrance on which the ring would sit. 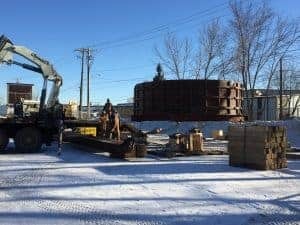 Once Neufeld Building Movers felt the ground was frozen enough to withstand the weight of the Blairmore Ring and their equipment, the move to its final home began. On one of the coldest days, a crew of five were on-site to load the Ring and move it for the last time. The Ring was raised up using jacks so the truck could back under it. Loading the Blairmore Ring. January 28, 2019. 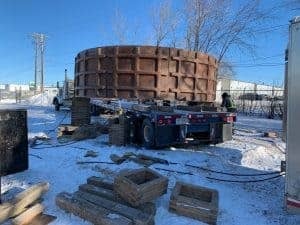 It took a lot of precision and skill to back the truck to the cement pedestals – it had to be even on all sides so the Ring would sit on the pedestals properly. Backing the Ring into place. January 28, 2019. It’s almost there! January 28, 2019. The same process was used to offload the ring using jacks, steel beams, blocks and rollers. 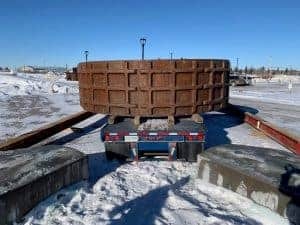 After a long, cold day the Blairmore Ring is in place at the WDM Saskatoon where thousands of people can see it and pay tribute to the potash mining industry of Saskatchewan. 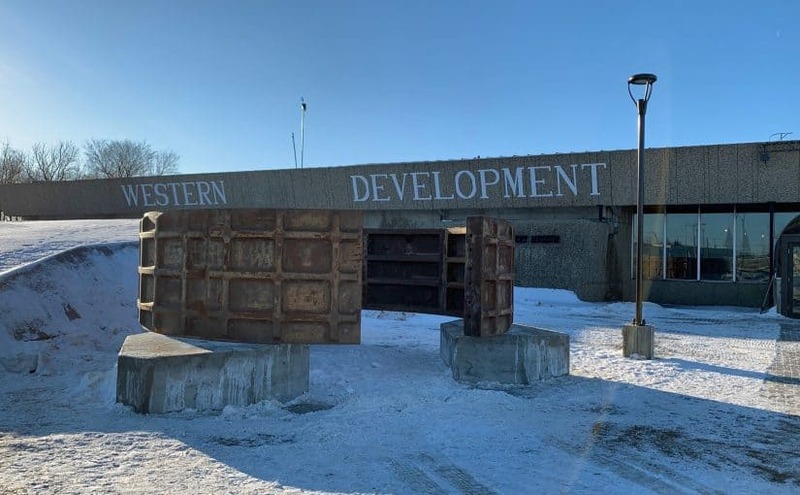 The WDM would like to thank Nutrien (formerly Potash Corp) for supporting the move and installation of the Blairmore Ring at the WDM Saskatoon.